Example of my work with this set-up can be sent if asked for. You can also see my set-up with the GH5 in photo 2. GH5 body with vlog & 6 batteries. Viltrox adapter for GH5 > canon glass. There's lots of little parts that no longer have the plastic bags they arrived in so they will arrive in the box, in bubble wrap. HDMI 90-Degree Adapter for BMPCC 4K. Color: Tilta Gray Finish. Materials: Aluminum Alloy. 90-Degree USB-C Cable (20cm). SSD Drive Holder for Samsung T5. 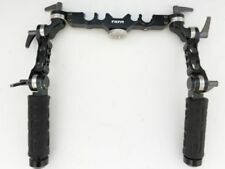 Tilta UH-T03 (UHT03) Universal Handgrip with 3 Joints (for 15mm Rails/Bars). Condition is Used. Please see pics for marks as it’s been heavily used. Changing to a smaller camera so this is no longer needed. Tilta TA-BTP-F970 F970 Battery Plate . 1, Tilta TA-BTP-F970 F970 Battery Plate. Tilta TA-SSDC-T5 SSD Drive Holder . 1, Tilta TA-SSDC-T5 SSD Drive Holder. We understand the concerns and frustrations you might have, and will do our endeavor to resolve the issues. Tilta CB-USBC-30 90-Degree USB-C Cable (30cm) . 1, Tilta CB-USBC-30 90-Degree USB-C Cable (30cm). We understand the concerns and frustrations you might have, and will do our endeavor to resolve the issues. Compatible with TiLTA BMPCC 4K Cage Rig. Colors: TiLTA grey. G.L OPTICS, LanParte, MITAKON, NiSi, PDMOVIE, PortKeys, Shoot35, SmallRig, TiLTA, Zhiyun-Tech…. Estonia, Latvia, Malta, Romania & Turkey £79.00. Tilta TA-T01-DC-PC DC Power Cable . 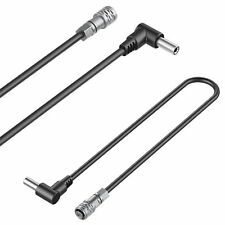 1, Tilta TA-T01-DC-PC DC Power Cable. We understand the concerns and frustrations you might have, and will do our endeavor to resolve the issues. Tilta TA-T01-HSH Half Sunhood . 1, TA-T01-HSH Half Sunhood. Warranty Service. 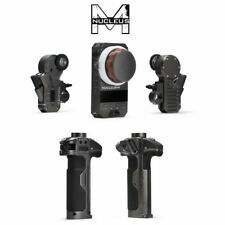 TILTA WLC-T03 Nucleus-M Wireless Follow Focus . (1) Wireless Handle Right (Iris, Zoom). The Nucleus-M is a wireless 3 Channel system. (1) Wireless Handle Left (Focus). (1) Wireless FIZ Hand Unit. 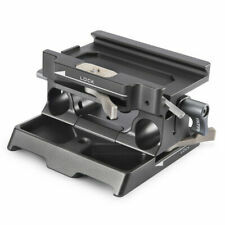 Tilta TA-T01-LAS Lens Adapter Support Bracket . 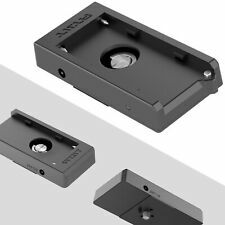 1, Tilta TA-T01-LAS Lens Adapter Support Bracket. We understand the concerns and frustrations you might have, and will do our endeavor to resolve the issues. Tilta BMCC Rig ES-T07 . (6) Protection brackets for BMCC ( Cage ) 1PC. (4) 300mm 15mm rod 2PCS. (7) 200mm 15mm rod 2PCS. (8) 15mm rod extension screw 2PCS. (9) Tool 1 set. It can be used on any tripod with 3/4 or 1/8 screw;. In addition, the cage and top handle feature three cold shoe mounts further expanding the accessories you can mount. 2, Panasonic GH4 GH5 Series Cage. 3, Panasonic GH4 GH5 Series quick release baseplate. Tilta TA-T01- QRTH Quick Release Top Handle . Tilta TA-T01-QRTH Quick Release Top Handle . 1, Quick Release Top Handle TA-T01-QRTH. We understand the concerns and frustrations you might have, and will do our endeavor to resolve the issues. 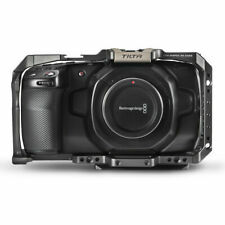 Tilta 4 5.65 Carbon Fiber Matte box . 4×5.65 Carbon Fiber Matte Box(CLAMP-ON). 15mm rod adaptor. Ф80mm/Ф95mm/Ф114mm/Ф134mm adaptor rings. Material:Carbon Fiber,Aluminum-Alloy, Stainless Steel. 1pc of top French flag. Tilta will produce the set ES-T37-A with wooden handle. 2, Panasonic GH4 GH5 Series Cage. 3, Panasonic GH4 GH5 Series quick release baseplate. 4, Lens convertor ring support. We understand the concerns and frustrations you might have, and will do our endeavor to resolve the issues. G.L OPTICS, LanParte, MITAKON, NiSi, PDMOVIE, PortKeys, Shoot35, SmallRig, TiLTA, Zhiyun-Tech…. Wireless range is 1000 feet, upgradeable to 1 mile. All components have OLED Displays and CNC precision engineered materials. Tilta full rig for bmpc or bmcc new. Only used the V lock plate on another setup. 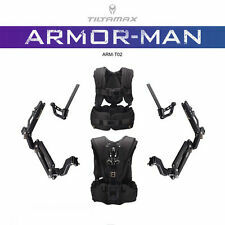 TiLTA-MAX ARM-T02 ARMOR-MAN Ultimate Steadicam Gimbal Support . • 2 x Balance support for 3 axis gimbal system(L/R). • Weight including case: 20kg ( The net weight of this rig is 8kg ). • 1 x Multi-functional adjustable Vest with IDX battery plate. The New TILTA TT-0516 Adjustable Offset Shoulder Pad Support replaces the TILTA TT-0504. TILTA TT-0516 Adjustable Offset Shoulder Pad Support. • 1 x TILTA Shoulder Pad Support. • 1 x TILTA Adjustable offset Rod Clamp Bridge w/ kip handles and 2kg counter weight. Tilta TA-BSP-15 15mm LWS Baseplate . 1, 15mm LWS Baseplate TA-BSP-15. Warranty Service. 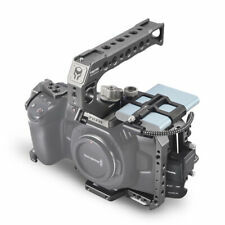 This ES-T07-2 rig can be used with BMCC, BMPC, Canon 5D serial (Mark I,II,III,IV), 7D etc, Sony FS5. The side risers provide 1/4"-20 and 3/8”-16 threaded mounting holes, and each side riser also features an ARRI-compatible rosette for mounting accessories. 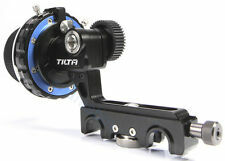 Tilta 3 DSLR Rig Follow focus Matt Box . 250MM Steer whip 1PC. 400MM Steer whip 1PC. Matt Box 1PC. Red One (An extra 19mm rod adaptor needed). Follow focus 1PC. 300mm Rod 2PCS. 200mm Rod 4PCS. TiLTA GR-V02 Gravity G2X 3 Axis Stabilized Handheld Gimbal. The Gravity G2X is a compact handheld gimbal system for: mirrorless DSLRS, DSLRS, Smartphones, and GoPros. Two rosettes on the handle allow for the mounting of various accessories to customize your rig with your needs. It also includes the TILTA III Front HandGrip compatible with both 15mm and a 19mm rod systems. The entire rig uses kip handles for extra adjustability in tight spaces. 1 x Tilta UH-T03 15mm/19mm Universal handgrip. TILTA LS-T05 PRO LENS SUPPORT. TiLTA's new version of the lens support is now in silver anodised aluminium, and has more pro features than the previous version. The C shape lens support has soft rubber rollers that cushion the lens without scratching. Protection brackets for BMCC ( Cage ) x1. 300mm 15mm rod x2. 200mm 15mm rod x2. 15mm rod extension screw x2. These are lovely bits of kit, manufactured to very high standards. TILTA Nucleus-M Quick Release Handle Grip Bridge (19mm/15mm LWR) . (1) Tilta Center Tightening Screw. (1) 15/19 Tilta Quick Release Bridge Unit. (2) 90 Degree Arri Standard Rosette Offset with Tightening Screws. TiLTA G1/G2 Dual Pistol Grip Battery Handles. (1) G2 Gimbal Body Bottom Protection Plate. Allows the user to use both hands and comfortably steer the Tiltamax G1/G2 gimbal. Each handle contains space for x4 18650 Batteries. 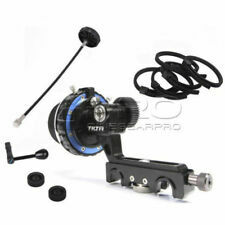 TILTA III FF-T03 Fluid Damped Follow Focus Bundle Kit. • 1 x TiLTA III FF-T03 Follow Focus. • 1 x TiLTA T025 Professional Focus Whip. • 1 x TiLTA Speed Crank. • 1 x TiLTA Drive Gear Mod 0.5. • 1 x TiLTA Drive Gear Mod 0.6. TiLTA continues its tradition of state of the art build quality, with a precision CNC milled aluminium body and an ergonomic Rosewood handle. 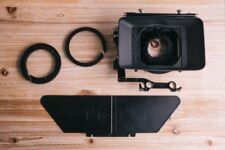 G.L OPTICS, LanParte, MITAKON, NiSi, PDMOVIE, PortKeys, Shoot35, SmallRig, TiLTA, Zhiyun-Tech….